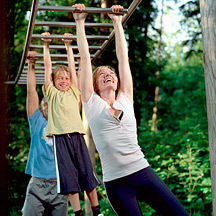 Remember the monkey bars? How about the exhilaration of running out to the playground, ready to hop, skip, and climb your way to exhaustion? Whatever happened to the days of non-stop fun, when playtime meant movement and going inside for dinner was like a prison sentence? When did free time turn sedentary and exercise a dreaded past time? As trainers we see a variety of fitness and ability levels. A common trend is limited relative strength, or a person’s strength to weight ratio. This means that, despite perceived fitness, a person’s ability to support and move their own body weight is poor. An equally common misconception is that strength training must be done in a gym and involve weights. This is false. Whole workouts have been based solely on body weight (“callisthenics”) and have proven to be extremely successful in increasing strength while minimizing injury due to improper lifting and overloading. So the next time you’re passing by a park or playground hop on and have fun, for old time sake. Com’on Mom, just five more minutes! Curious about this workout but don’t know where to start? Contact us to set up a training session!